Eldest son of actor Lloyd Bridges, Beau Bridges is part of a preeminent Hollywood acting dynasty. In 1990, he was named Best Supporting Actor by the National Society of Film Critics for his performance in The Fabulous Baker Boys, in which he starred opposite his brother Jeff. In 1992, he received an Emmy, a Golden Globe, and a CableACE Award for Outstanding Lead Actor in Without Warning: The James Brady Story. He garnered another Emmy and Golden Globe in 1993 as Outstanding Supporting Actor for The Positively True Adventures of the Alleged Cheerleader-Murdering Mom. A third Emmy was won in 1997 for Outstanding Supporting Actor in The Second Civil War. In total, he has been nominated for 10 Emmys and for four Golden Globes. Bridges has portrayed a myriad of characters during his successful career, which spans more than four decades. He started at a young age, making his feature-film debut in director Lewis Milestone's The Red Pony. He also appeared in his dad's TV show Sea Hunt. In 1967, Bridges played his first adult role in Larry Peerce's feature film The Incident, and he has worked virtually nonstop ever since. 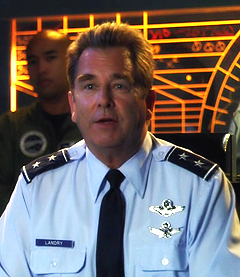 Beau Bridges has now a regular role in Stargate SG-1, playing General Hank Landry. Gilles Nuytens: I understand that the shooting of the Stargate movies is complete. Can you talk about your experiences in doing movies and describe some of the differences between the movies shoot and the series? Beau Bridges: The series is now complete. I joined at the last two years of the series as General Landry and now we’re making two, two hour movies, based on the same franchise, the same characters. And Robert Cooper and Brad Wright, the showrunners and creators of the show, got a little bit more money for their production values. Actually, for one of the movies, we went very close to the North Pole, up in the Artic Circle and worked on a submarine that goes under the ice. I think it’ll be, should be pretty pleasing to the fans. Gilles Nuytens: Can you talk about your experience in the Ark of Truth? Beau Bridges: It takes off where the last episode of the series began. And it’s pretty much kind of tying up some of the strings of that story. The Ori are very much involved and threatening us with one last attempt to attack us. And I actually get on a ship, which doesn’t happen very often for General Landry’s character, and I go out and get to be involved in the battle, which is kind of fun. Gilles Nuytens: What can we expect from General Landry in the two movies? Beau Bridges: I think that by now, in the very beginning when I first joined the show, General Landry was like a new kid in school. I was coming into a situation I didn’t really know much about, and now, after a couple of years, the character’s kind of mellowed and gotten comfortable working at the command center and very comfortable with his troops. What they always do with these shows is they always leave them open-ended. The SG-1 franchise has been so successful for the network, that they always want to keep it open, an option to do it again in some way, whether that’s a movie or a series, or whatever. Gilles Nuytens: There must be a lot of jokes and funny experiences on the sets. Can you share some that happened during the shooting of the two new movies? 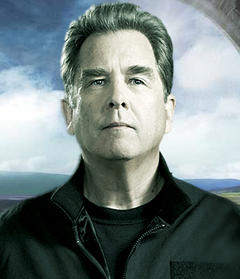 Beau Bridges: The guy who leads all the humor that’s involved is Chris Judge, Teal’c. It was a lot of fun getting back together. We hadn’t seen each other for a long time, after the hiatus of the show. It was great fun getting back together with the troops and seeing Ben Browder, who is actually a neighbor of mine in California. And we spent a lot of time together. So it was great seeing him. There are a lot of babies on the set now, because a lot of the ladies have had kids. And kids are always welcome on the set of Stargate: SG-1. They’re all over the place. Which is great because it kind of brings the experience into perspective, because, in the end, that’s what we’re doing: we're out there playing, pretending. A children’s game. Gilles Nuytens: Are there already any talks of what’s going next for SG-1? Beau Bridges: Nope, not yet. I’m actually going in two or three days up to Vancouver to complete the second movie, my work. I hope to talk to the guys up there when I get up there to see if there’s any other talk about doing anything with Stargate. But like I said, business is about money. And if a network knows they can make money off an idea, then they’re going to keep doing it until it’s done. And I think we’re still making good money for them. They might think of a different way to do it. Gilles Nuytens: There were some rumors of a third Stargate series. Do you know anything about that? Beau Bridges: No, I haven’t heard anything. But I’m excited about that proposition and it would be fun if I got to be involved in it. But I’ll talk to the guys when I go back up and find out what’s going on. But so far I haven’t heard anything about a third series. Gilles Nuytens: Can we expect to see you in season four of Atlantis? Beau Bridges: Yes, as you know, I appeared several times on Atlantis while I was doing Stargate. And they’ve mentioned to me before that they’d like me do some, but right now I have nothing specific to report. I know Amanda Tapping is a regular now on the show. But I have no plans to do that as we speak. But I don’t know. Gilles Nuytens: Would you like to continue your Stargate experience toward Atlantis? Beau Bridges: Oh sure. I really enjoyed General Landry, his character, and as many times as I could play him would be a joy whether it’s on Atlantis or Stargate: SG-1. The people who run the Atlantis operation are really the same group behind the scenes that do Stargate. And they run a real tight ship. And the actors on Atlantis, I really like them. So yeah, sure, I’d like to do more of those. Gilles Nuytens: Every actor use some aspects of their own personality to build their character. What aspect from yourself did you use to play General Landry? Do you have anything in common? 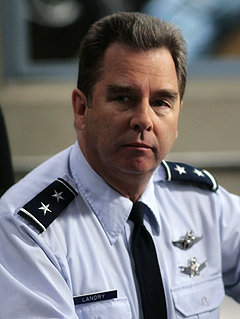 Beau Bridges: Well, what was interesting in creating this character, when Robert Cooper and Brad Wright asked me to be a part of the show, there was no script and there was no character, other than the fact that he was a general. So, they just said can you come aboard SG-1 as a general. And I said, well, great, I said, let’s talk about who this guy is. And they were nice enough to allow me to collaborate with them on creating the character. And I did that. And because I was stepping in a pair of shoes that I’ve not experienced—I’ve been in positions of leadership, but I’ve never been a general before—I went out and researched all the American generals from General George Washington up to present and made a collection of things they said and believed. Wrote it all down and then actually put it into categories, because the generals, I found out, were talking about things they had in common: like family, battle strategy, life, death, and all these things. So I categorized all my notes, my findings, and then I handed that into the producers and the writers and they used a lot of that in developing my character. I had played presidents before, the head of the CIA, and guys who were in positions of leadership, and have directed films before, so I have been in positions of leadership myself. I also had two men that really impressed me in my early life, who were leaders: that’s my dad Lloyd Bridges, who was an actor and kind of a leader in his field, and also my college basketball coach, John Wooden, who was one of the most successful college basketball coaches that ever lived. He won ten straight national championships. I use those guys as inspiration a lot. My father, my coach. That’s kind of how I came up with General Landry. Gilles Nuytens: Are you happy with the evolution of General Landry since you first appeared in the show? Beau Bridges: Yes, I like the way he’s evolved as a character, General Landry. Like I said in the beginning I was kind of new to Stargate Command and perhaps a bit nervous about it. I had been retired and did not really want to come back into service, but they pressed me to do it, Jack O’Neill. And I get back into it. At first, I was kind of whipping people into shape, losing my temper a few times, but then as the seasons have gone down, General Landry has gotten more comfortable with his command position, so I’ve been able to relax as a person. They’ve also given me stories, my character, where I can evolve as a human being beyond just planning battle strategies and stuff. Did that episode where I took the team up to the mountains, to a mountain cabin to get their sort of r&r, little rest and recuperation. And that allowed me to have some fun with them, the team, in a more human kind of way, an easy going way. And then my whole family relationship, with my daughter, I thought that was a really interesting evolution for my character, because I was estranged from my daughter and my ex-wife. We came up with that idea because I think people who are in positions of leadership, they are human just like the rest of us and have the same kind of problems. I thought that would be interesting to show that. Gilles Nuytens: Did you have some input in creating the character of Dr. Lam? Beau Bridges: Not so much in her character, once it was decided, but the part that I was involved in was just coming up with the concept of me having an ex-wife who I met in Vietnam and having a daughter that I was estranged from. And then they came up with the idea of having her go to work at Stargate Command, instigated by Jack O’Neill, which I thought was a great idea to create a lot of tension and stuff. It’s good. And she’s a wonderful actress, Lexa, who plays Dr. Lam. You know of course she’s Michael Shanks’s wife in reality. Lexa Doig. Gilles Nuytens: Yeah! Are you going to participate in the special features of the upcoming season 10 DVDs? Beau Bridges: I’m not sure. I haven’t so far. But they may ask me to when I go up there. 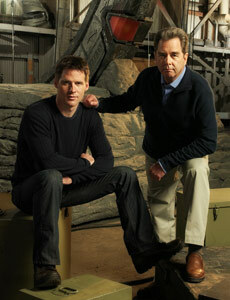 Gilles Nuytens: After two years on the Stargate franchise, what is your best memory from it? Beau Bridges: Well I think, it’s almost like any job, the thing that I remember most about the experience is the people I worked with and the friends I made. Like I told you before, it’s a really great group of people that are behind the scenes as well as the actors. And they all have really a great time. It’s a real party doing that film; it’s not hardly like doing work at all. And that’s what I’ll remember the most about them: the people. Gilles Nuytens: What was the most challenging scene you had to do in Stargate? Beau Bridges: For me the most challenging aspects of doing the show, all the scenes really I had to do that involve technical stuff. You know, different weaponry, the kind of space talk about the ships, and all of that, gets very confusing to me, because I’m not up on all that stuff. I really appreciate how Amanda Tapping and Michael Shanks, they get most of that kind of dialogue. And they just whip right though it, so they were kind of an inspiration to me, but I’ve always had a little bit of difficulty with it. I had to go over it and over it again and again until I got it right. Scientific gobblegoo. Gilles Nuytens: What was the most enjoyable scene? Beau Bridges: I had one, I really love an episode, I forget which season it was in, but it was with Dr. Lam, with Lexa Doig, and we were beginning to break through our estrangement and I had basically asked her for forgiveness when I thought I was going to die. And it was a good scene. One of those scenes that you never know quite how it’s going to turn out but you hope for the best. And in this case I thought it turned out pretty good. 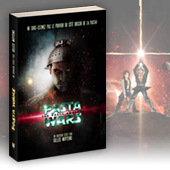 Gilles Nuytens: You mentioned earlier that you liked sci-fi. Do you have any new sci-fi projects coming? Beau Bridges: Not so far, but in the past I’ve done them. And in fact, and I don’t know if you’re aware of the fact, Brad Wright, he’s one of the show runners, he helped create a series about ten years ago: The Outer Limits. Myself and my father, and my son, Dylan, who was ten at the time, we did the pilot, the two hour movie called the Sand Kings. We kicked that off. So sci-fi is something that I’ve always enjoyed, but right now I have no plans. Brad Wright wrote that. I think he wrote it. I know he produced it. Gilles Nuytens: What are your other upcoming projects? Beau Bridges: Well, I’ve done a number of these "My Name is Earl" shows. I play Earl’s father. It’s a half-hour comedy. And I’ll be doing some more of those. I have a movie coming out that I did with Misha Barton, called Don’t Fade Away. Gilles Nuytens: Can you speak about that movie and your role in it? 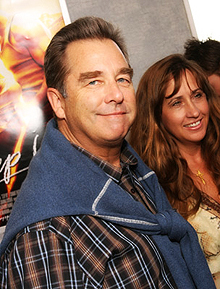 Beau Bridges: It’s about a father who is dying and his relationship with his son. And Misha plays my son’s girlfriend. Gilles Nuytens: Can you speak about your experience in "My Name is Earl"? Beau Bridges: It’s a hit comedy series. Jason Lee is the lead actor, Earl. He’s kind of a real crazy character, and so is his dad. And I get to play his dad. And we have a lot of fun. He put me through hell when he was a kid. And if you know about the show, he’s trying to cross off a list of all the terrible things he’s done to people through out his life. He’s trying to make it good with all these people that he crosses off. And he’s done so many terrible things to me, his dad, that he’s always trying to make it better. Gilles Nuytens: Last year, you appeared in four episodes. Are there any upcoming appearances? Beau Bridges: In this next year, Earl goes to prison. And Greg Garcia, the guy who runs the show and writes them, told me that he wants me to come and visit Earl, in prison. I haven’t seen any scripts yet, but that’s probably what’s going to happen. Gilles Nuytens: You also play in a movie called the Good German, with George Clooney. Can you talk about your experience on the movie and your experience with the actors? Beau Bridges: Sure. Steven Soderbergh was the director on it. I didn’t have a very large part, but I had three or four nice scenes. He was an excellent director. I was very impressed with him. Very efficient. Got things done on time. And then most of my scenes were with George. I was also impressed with him. He’s a really nice guy, makes it all really easy. We just had a good time. I thought it was remarkable how they recreated wartime Germany on a back lot, in California. It was pretty amazing. Gilles Nuytens: Do you have some interest in writing or directing movies? Beau Bridges: I’ve directed seven or eight films. And always really enjoy the process, would like to do it again. It’s just a matter of finding the time to do it, because directing takes up a lot of time. It’s not just the shooting of the movie, but you have the pre-production and the post-production, so it’s usually three or four months of your time. Fortunately I’ve been busy as an actor, so I haven’t found the time to do it, but I want to. And likewise for writing. I’ve done some writing. I haven’t had anything I’ve written made into a movie yet, but I’m always trying. I’m very interested in creating the stories. Gilles Nuytens: From all your amazing career, what are you the most proud of? Beau Bridges: I think I’ve gotten some great opportunities. I do believe, like Shakespeare said a long time ago, the play’s the thing, the story is the most important element. And I’ve been able to tell some good stories. I got in Norma Ray, with Sally Field, that was a good story. The Fabulous Baker Boys, a movie I did with my brother, I thought was a wonderful story. On television, I did Without Warning: The James Brady Story, about the press secretary, Jim Brady, who got shot while he was alongside President Regan. I’ve been fortunate to get to be in some good stories. Gilles Nuytens: Some actors are fond of the show, they play on it. Are you a fan of Stargate? 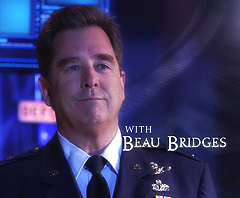 Beau Bridges: Oh yeah, I love Stargate. I enjoy watching it. And I hadn’t seen too many before hand. They sent me a bunch to watch and I Liked them because of the stories. I think it’s fascinating how Brad Wright and Robert Cooper are able to create this whole world. It’s just amazing. And I think one of the things that drives them is they feel a responsibly, as all the actors do as well, to this incredible group of fans that we have that who are so dedicated to the show. So we always want to make it the best we can. It starts with the guys who write it. And I think Rob Cooper and Brad Wright and all the wonderful team of writers they have turned out some great stories. Gilles Nuytens: What do you like to watch on TV? Beau Bridges: I’ve been watching Lost a little bit, I like that. And I like Dancing with the Stars. And I like American Idol. My favorite singer won this time. Jordan. Thought she was a really great singer. I don’t watch a lot of tv. I watch a lot of sports on tv. Basketball. Whatever’s on. Gilles Nuytens: Is there any project or movie you’d really like to be part of? Beau Bridges: I don’t know. I just love to work. Once again it depends on what the story is, but right now, no, nothing specific that I can think of. Gilles Nuytens: They’ve created that show, called Sanctuary, that’s only available online. What do you think of that kind of TV show? That new kind of TV show? Beau Bridges: I think we are in a very exciting period of time for our business because all of the technological side of it is changing so rapidly. And how we’re going to distribute films. It’s exciting to be a part of that, but it’s also a little worrisome, because as a actor you’re not quite sure how you’re going to fit in. But I’m sure they’ll work it out. And I think, yeah, it’s all going to streaming product, direct to the net. I’m sure they’ll figure it out. The hard part is going to be decide how we’ll all get paid and how all that works out. But they’ll figure it out.